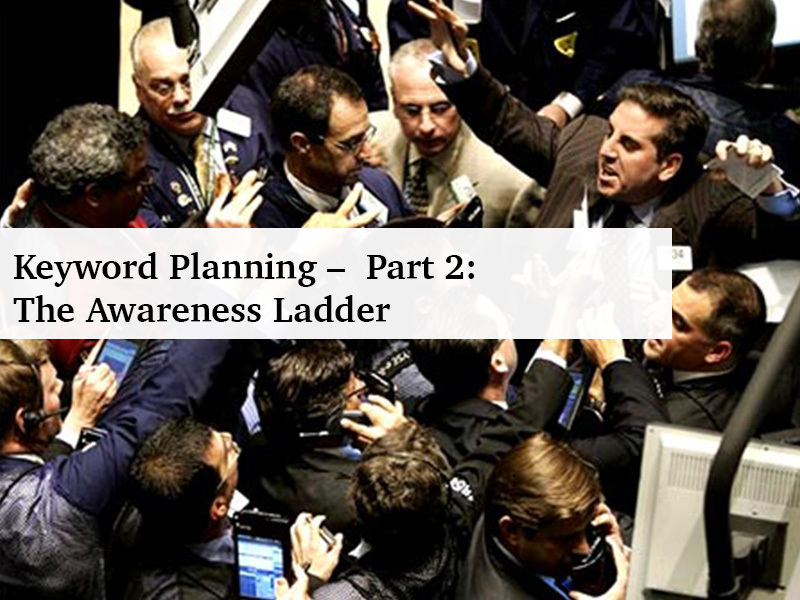 An overall important feature in keyword planning is the thematic build-out and structure of an account (we utilize the “Awareness Ladder” at seOverflow – more on that later.) The thematic build-out helps devise the actual structure of ad groups (to properly structure your campaign). By structuring these terms in the thematic ad groups, we are appealing to Google’s pricing to maintain a relationship to the Quality Score we described in Part 1 of our keyword planning series. It’s not uncommon at seOverflow to uncover 1000 – 2000 keywords when we are doing initial research for a client’s project using Google’s keyword planner tool or other similar keyword research tools. PPC requires casting a large enough net to capture all of a client’s related service offerings. The problem is keyword tools will often spit out crazy terms, and this requires ppc managers to dig through the spreadsheet data diligently in order to determine what fits and what does not fit. This is not always a fun prospect, but it is necessary if you wish to “hit the ground running” on a new account. The whole idea here is that when we build an account we are looking towards the top of a keyword funnel, and we are narrowing the prospects down by adding new terms and negative terms as we progress with the account. It will be important to launch the account with a strong keyword-ad copy-landing page relevance. This will allow our account to perform at a much more efficient level as opposed to sending all keyword traffic to more general pages. As the account progresses and new keyword opportunities are found, we will then need to continue creating relevant content and ad copy in those areas. Otherwise, we will end up paying more certain keywords and providing traffic with landing pages that are not optimized for conversion. All of these decision will be based on key performance metrics with the goal of continuing to drive cost-per-acquisition down while increasing conversion volume. A key methodology in determining the keyword funnel level we use at seOverflow is the “Awareness Ladder” developed by Ben Hunt, author of the book Convert!. What we are doing is looking to appeal to potential consumers at various stages of the buying cycle. Searchers know they have a generic “issue” and keywords are searched for like “vacation ideas.” On the Paid Search side of things we tend to limit our use of these terms since they can be very generic as well as very costly. At this stage, the prospect is searching by using product (or service) specific keywords such as “Paris Vacation” or “Paris Tickets.” Searchers will be using fairly specific local terms. At this point, you are attempting to appeal to a search who is looking for a specific solution and making comparisons amongst different offerings. This is the stage where we are going to be bidding on terms that have modifiers such as “Pierre’s Discount Airline Review” and “Fifi’s Airline discounts/coupons” with brand terms. At this point, they are ready to buy, so they will either fill out a purchase/contact form or contact you directly (which speak volumes as to why phone call tracking with keyword level tracking is necessary). A lot of brand specific terms will be included here. The terms are really inexpensive because you own these terms and the client is ready to make a move. Many of the terms seOverflow will focus on will appeal to stages two and three – and it is important to think about these stages when we are building out the ad group structures as well as ad copy to appeal to the searchers and meet them where they are. In stages two and three, we are attempting to appeal to searchers as early as possible and get them to the client’s site. We continually review and mine the different terms’ performance. From here we will look for new terms to add and old terms to remove or bid down to provide the best converting terms at the lowest Cost Per Acquisition/highest ROI possible for our clients.